I decided that, in order to help honour the spirit of this competition, my prototypes should be extra disposable. So I have a disposably-named thread to keep that in mind. DISCLAIMER: NONE OF THE GAMES HERE ARE ACTUALLY NAMED "NANDREW STUFF"
Defeating all three randomly-generated aliens is your goal. For an alien to die, all of its gems (red, yellow and blue) need to be knocked down to zero. For a dwarf to die (that's you, buddy) only ONE gem colour needs to be depleted. So yar, take care! In each combat round, one of the aliens will take a turn to attack, draining one of its gems to deal colour damage to one of your dwarfs (usually whoever's in front). The arrows above show who's attacking and who's being attacked. Impending damage is circled in green. To deal with this attack before it resolves, you're allowed to choose ONE dwarf and select ONE ability (shown circled in pink). This will buff gems of the appropriate colour and often move dwarves around. The movement bit is important, since enemy attacks don't target the dwarf, they target the SLOT the dwarf was occupying -- understanding this is super helpful. Every time you win a combat situation, your party level goes up by 1 and the situations become harder / more interesting. Every time you lose, you slip down 2 levels. If you want to see the maximum complexity this prototype has to offer (and start seeing which ideas I'd want to put into a full project), try getting your party to at least level 4. I played it until level 7, and I feel pretty pleased with myself about that, (though the looming numbers on the aliens frightened me in such a way as to make me think that that point was the precise right moment to quit). It's a fun puzzle to figure out. I felt that the "your party has leveled up" was a little disappointing seeing as the members didn't persist as I had expected them to, though I was fine with the rehiring mechanic. It's pretty damn simple, which was the point. I can't imagine it being simplified much more (although I suspect some JRPG's do, to their detriment). I suppose, and this is maybe a personal thing, I'd like some of the buffs to be flavorful. I understand that the enemy is attacking with 1 red... but it might be nice if it was going for a "pacifying attack" or something, and to buff your hero you might feed him "anger beer" or something. However, for the purposes of the competition I'm fairly certain that flavour is unnecessary. I liked the emergent moment when my last dwarf was at the back and I had two free turns to buff him up while dodging the enemy attacks as I charged my dwarf forward. Not that it really matters, but in some ways the emphasis for distinguishing the character classes is the reverse of the emphasis in party based RPGs. In party based RPG's the role the character fills is often based on his/her attack. Tanking is one of those roles in party based RPG's, however in DVAF all the characters are tanks (aside from the healer) and the roles are based on how they tank best. I guess it fits then that they're dwarves, dwarves being the tanks of Middle Earth and all. Clicking any ability will move your dwarf forward one slot (swapping places with other dwarves where applicable) and buff that colour by one gem. @BlackShipsFilltheSky awesome on the emergent moment thing! I felt that it was a really satisfying part of the system. If working on this further, I'd plan on giving each of the colours more of a personality. 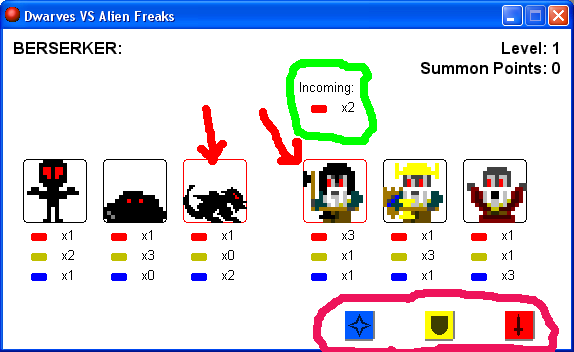 There's a (very slight) trend towards this already, usually shown in enemy attacks: red is strength (aggressive and damage-dealing), yellow is stamina (builds up quickly and defensive) and blue is spirit (AOE, backline attacks). I wanted to ask. Is there a reason to damage any particular stat of the aliens? Is there an advantage of removing all their red point for instance? I suspect this affects what type of damage they do, but I couldn't figure out exactly what. (Obviously this is early stages, I'm curious to see what you're building up to, feels like there is room for a lot more strategy). Hey, here's another one. I call it "Dwarves vs Alien Freaks". This was originally designed with the brief idea of "XCOM with digging". It took a weird left-turn somewhere because there was a heavy emphasis on AOE and friendly fire. You lead a small band of dwarves through some underground chambers, hunting down aliens, smashing through dirt and basically trying to clear as many rooms out as possible before the aliens overpower and overwhelm you. Along the way, you'll pick up vital tools to increase your damage and threat range, but the most powerful weapons are often the ones that are most ready to kill your allies! Wheee! So, do you go full offense in a gambit to clear more rooms, while increasing the risk to your own party? Or do you nerf your attacking capability to reduce cases of friendly fire (and increase your risk of being overwhelmed by aliens instead)? 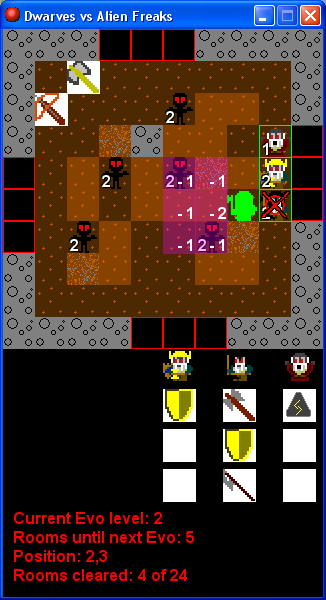 - In combat, each dwarf takes a turn, then the aliens move. You can move in one of four directions, and you'll always make an attack after you move, in whatever direction you're facing. Take care here, you'll ALWAYS make an attack, even in non-convenient situations! The rest you can see for yourself, methinks. Challenge yourself to clear as many rooms as possible, it generally gets unbearably tough by about Evo 4 (and that's after you know what's going on!). I die more by friendly fire than any other danger!